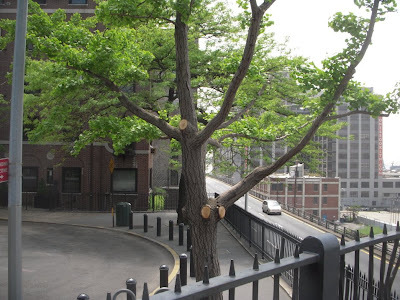 This is our fourth post in a series where we are watching the Honey Locust trees on the Brooklyn Heights Promenade this spring to see how well they might recover from the Waterfalls project that was self-congratulatorily masterminded by Mayor Bloomberg last year. The question is: Will this be our last post? 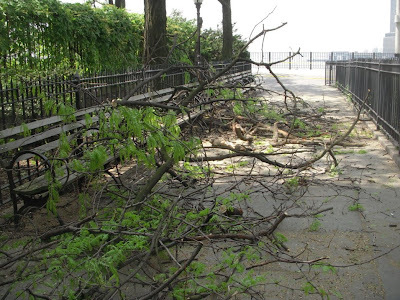 That is because this post is about the Parks Department’s trimming of the tell-tale tree limbs and branches that were showing how much the trees had been stressed. Watch It Bud . . How “Bloomie” Are Things After Bloomie’s Falls? 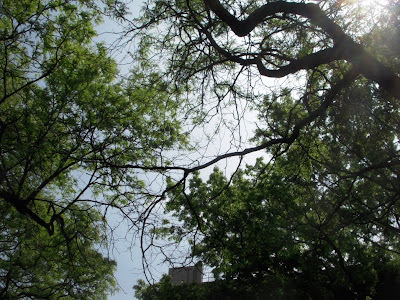 (Monday, April 27, 2009). Up till this time we had been reporting that the trees are not recovering well and providing comparison pictures showing how the affected tress looked as opposed to healthy trees that were far enough away from the nearby waterfall so as not to be affected. Watching the situation over time, the first date we took note was Monday, April 27, 2009 and the last was Friday, May 8, 2009. 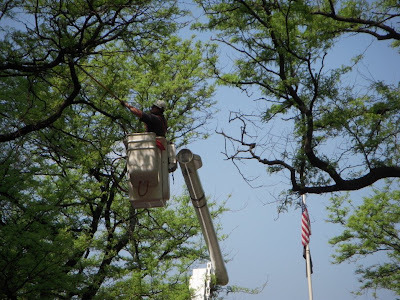 Last week Parks Department employees showed up to trim away what we were photographing. The pictures in this post, including the first above, are from Friday (the 15th). The workers had already been working several days. Friday they started in the morning and worked at least past 2:20 PM, this being their sole job for the day. 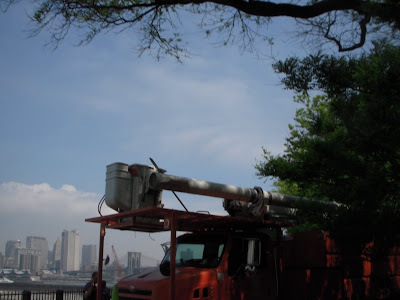 They were aware they were trimming away the damage done by the Waterfalls. 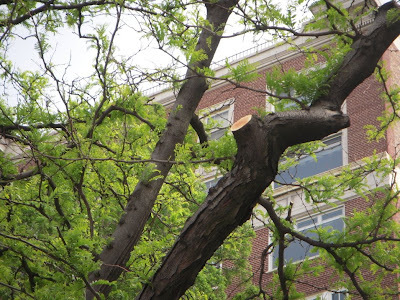 I pointed out to them that they had missed trimming away a lot of damage including one mature, very large tree that may not come back. 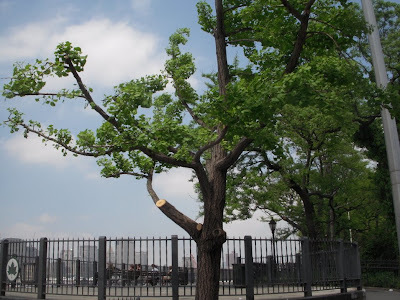 They said that was because they were dealing with the damage in segments and expected they would be back another day to deal with that separate area. Watching the tree limbs fall to the ground we were struck by how brittle some of the killed branches were, shattering into many fragments that bounced up when they hit the ground. 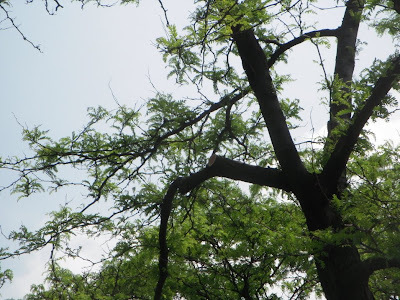 In most of the areas where they had trimmed, the dieback we photographed and showed in our previous posts was no longer obvious, especially if you were not thinking to look for it. 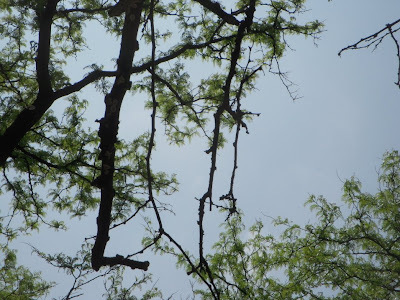 What you could see if you were looking was that the branches were substantially thinned out. For instance, there is now a clearer view of the water at the entrance to the Promenade than in prior years. 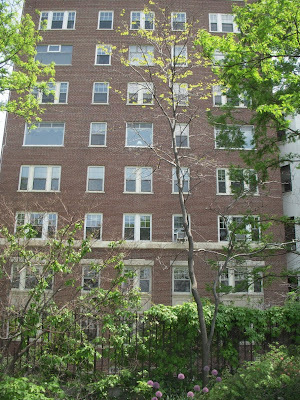 Many of the windows of 2 Montague Terrace that look out at the harbor have little green in front of them anymore where limbs were taken down and where there is a sparse and sad-looking little sapling that may be dying and which was apparently too young to trim. The last thing you see when you look are the cuts on the trunks where limbs used to be growing. 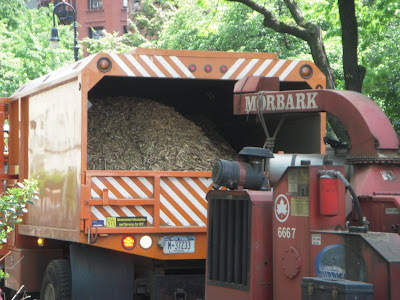 As noted, the Parks Department workers’ job is not complete. 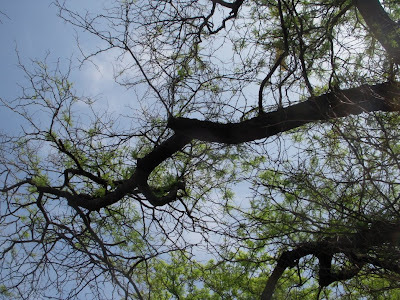 Even so, there may still be some limbs where dieback still shows the effect of the damage. 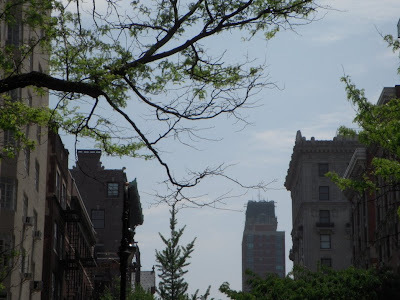 It is also unclear how the trees will fare later in the summer. 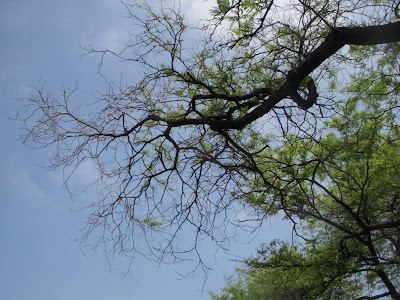 The trees' roots may still be drawing salt from the soil. 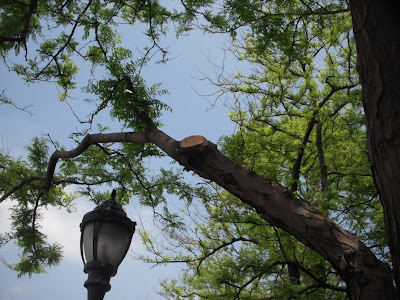 In 1996 when many of city’s trees suffered salt-shock from sidewalk salt after a winter of extraordinary snowstorms, the recovery was not always a smooth, straight line and late in the season we lost trees in wind storms that had been weakened, even though they had finally sprouted considerable new growth after dying back. 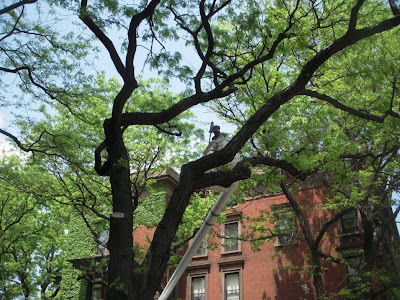 We note in passing that the Brooklyn Eagle ran the briefest of stories consisting mostly of a quote from one of the workers that the trees “are healthy.” (See: Brooklyn Heights Treetment, published, Wednesday, 05-13-2009.) 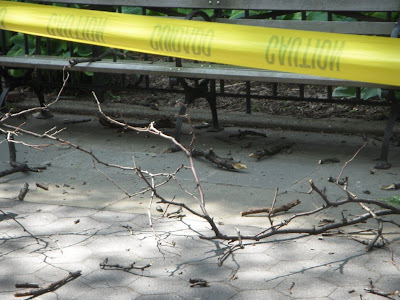 Having seen the dead branches shatter hitting the ground and seeing how much the trees have had to be cut back, that doesn’t seem to be an accurate assessment. The trees are alive. Most, if not all of them, may recover. But Bloomberg’s Waterfalls do not appear to have been a healthy experience for them. 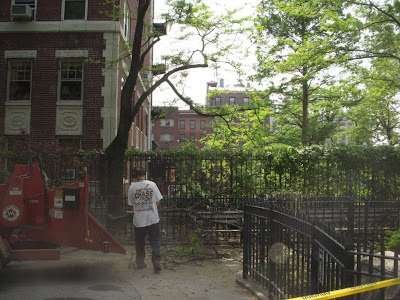 The Parks Department’s trimming, while hiding the full extent of the damage that was previously readily visible should ultimately be good for the trees. 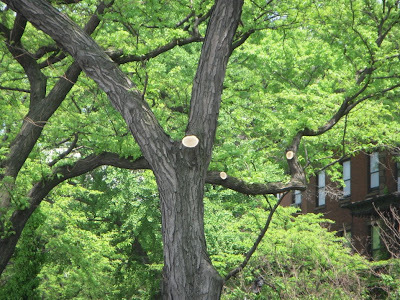 Among other things, the weakened trees will be less likely to blow over in a storm with the dead weight trimmed away. But, it may be the end of our series because it will be harder to take pictures that clearly show the damage. We shall see.